ClubCoins Nødvendigt: 507 Please note that, for now, you cannot download content from our platform directly onto a mobile device (phone, iPod, iPad, tablets...). You need to download your items onto a PC or Mac, and then transfer them onto your device in the normal way. We are working on allowing direct downloads to mobile devices but this is not possible in the current version of the platform. Sorry about the inconvenience! Winner of Northern Lit AwardFinalist for the Leacock Medal for HumourQuill & Quire "e;Books of the Year 2016"e;Globe & Mail "e;Best Canadian Fiction of 2016"e;A woman goes over a waterfall, a video goes viral, a family goes into meltdown -- life is about to get a lot more complicated for the Parker family.Like all families, the Parkers of Thunder Bay have had their share of complic… ations. But when matriarch Kate Parker miraculously survives plummeting over a waterfall in a barrel -- a feat captured on a video that goes viral -- it's Kate's family who tumbles into chaos under the spotlight. Her prodigal daughter returns to town. Her 16-year-old granddaughter gets caught up in an online relationship with a man she has never met. Her husband sifts through their marriage to search for what sent his wife over the falls. Her adopted son fears losing the only family he's ever known. Then there is Kate, who once made a life-changing choice and now fears her advancing dementia will rob her of memories from when she was most herself. 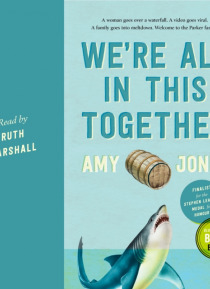 Set over the course of four calamitous days, Amy Jones's big-hearted first novel follows the Parkers' misadventures as catastrophe forces them to do something they never thought possible -- act like a family.